I went last week to one day at the 2018 WoW Festival on the South Bank. WoW is now in its sixth or seventh year. I’d been once or twice before and always learnt a lot and been invigorated by the sheer energy of the festival, so it was a pleasant surprise to learn that it is now in effect a global franchise, with equivalents happening all over the world – a real tribute to Jude Kelly its originator. The first session I attended had several speakers, all of whom were in their own ways inspirational – a paradoxically tired term, but one that in this case applies accurately. I’ll pick out just two. First up was Dame Helena Morrissey, founder of the 30% Club, and a leading person in the finance world. I’d heard Helena speak before and was struck again by her approachable style: her record is quite intimidating (demonstrable success in the world of finance, an impressive record of practical systemic innovation for gender balance – and nine children) but she is not. She made the powerful argument that digital innovation linked with longer working lives will upset traditional working patterns and remove many of the pillars of traditional male hierarchies. I happened to bump into Helena in the foyer afterwards and told her I was looking for where I could get hold of her book, A Good Time to be a Girl. “So am I,” she said – the publishers and bookstall-holders had not managed to hook up. So we trailed around together for 10 minutes looking for it, eventually finding a copy on the sub-ground floor. Their loss was my luck – I came away with nicely dedicated volume, which I can thoroughly recommend. I’ve copied Ch 7 for both my daughters, for its excellent advice. But it’s much more than a ‘how to’ volume. 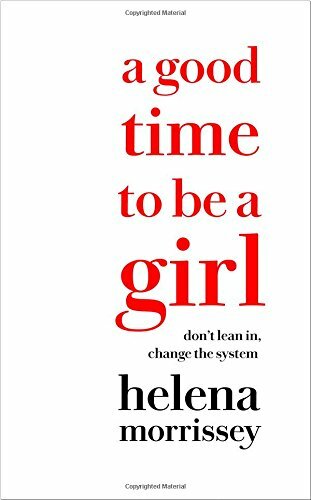 Helena deals with systemic change – in fact the subtitle, very appropriately, is ‘Don’t Lean In, Change The System’. Second was Halla Tomasdottir, another strikingly successful financier. Having managed, highly unusually, to survive the Icelandic banking crash a decade ago Halla thought she would try her luck in standing for the country’s presidency – as one does. With 7 weeks to go her poll ratings were around 1%. Did she give up? No, she finished in second place with 30% of the votes. She had a lot of sensible insights, and by ‘sensible’ I don’t mean that they were dull. They included a very telling definition of courage – with humility as a central component. Not a quality I’d associate with President Trump, Foreign Secretary Johnson or Mr Nix of Cambridge Analytica infamy – all examples of the kind of overconfidence that should not, ideally, gain anyone preferment. The key thing linking both women’s presentations is this: they spoke as much about how the system should change as they did about what women should do to make progress. In other words, they had alternative visions of what ‘leadership’, ‘management’, ‘success’ and ‘career’ mean. This is exactly the point of the sub-title of Helena’s book. They dealt with what I called ‘reverse convergence’ in the Paula Principle – but much more persuasively.